Agitators range in size from small agitators used in laboratory applications to large industrial agitators with 10,000-gallon capacities. High Shear Multi-Shaft Agitator – ARDE Barinco, Inc.
Agitators can be combined with other in-tank mixer types. Simple agitators can be used in large batches but are not very effective outside of producing flow, promoting heat transfer and maintaining in-tank uniformity. 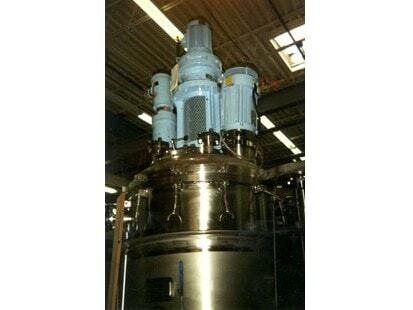 Agitators in food mixing and industrial product processing may have similar configurations, or they may be removable agitating rods which are placed into a substance only long enough to properly agitate it. Agitators are used mainly in liquids, as agitation is not as effective with thick, highly viscous materials. Important considerations when selecting an agitator include the product specific gravity, viscosity and characteristics of the material being used. Agitators can be used for a variety of applications. They can mix a wide range of substances or aid in the manufacture of paints, inks, varnishes, adhesives, and grease lubricants. They are also useful in the creation of industrial, commercial and household products such as cleaning compounds and liquid detergents. Maximizer System Agitator – ARDE Barinco, Inc.
An agitator is powered by its impeller, which is the part of the agitator that imparts force to the material being mixed. Examples of impellers are propellers, turbines, gates, anchors and paddles. A common example is the central agitating blade in a top-loading washing machine. It remains stationary on its center axis, agitating water and clothes with its paddle as it turns. Agitators that have impellers with higher motion capabilities or double impellers can be used for mixing high viscosity products such as grease lubricants, adhesives and polymers. Multi-agitator mixers feature several independent agitators and a flexible controls system, allowing them to easily switch gears to accommodate a fast-changing variety of products. 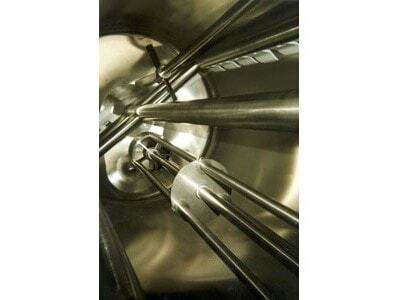 Multi agitator mixers are ideal for companies that are focused on short campaigns and fast changeover. Significant advances have been made in this technology, specifically in the agitator design, power/liquid induction, heat transfer and controls. These mixers allow the operation of two or three different agitators in an almost infinite variety of functional combination during the processes of charging ingredients, mixing and then discharging the end product. The addition of a third agitator greatly enhances the functionality of the mixer. Each agitator is independently controlled and separately powered by an electronic variable-speed drive. Agitators Agitators are industrial mixers that typically mix substances with low viscosities in low-shear applications. Agitators are basically process aids because their main functions, including producing flow in a vessel and ensuring in-tank uniformity, are secondary to the whole process.